Last week we published the design concept for the The Immersery which has now opened to the public as the centrepiece of the Melbourne Food and Wine Festival. 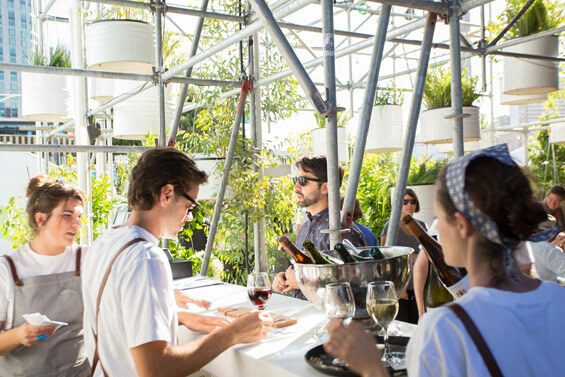 The Immersery is a cloud-like structure suspended above a floating bar and open-kitchen restaurant on the banks of Melbourne’s Yarra River designed by international design practice HASSELL, from a concept dreamt up by the team at Melbourne Food and Wine Festival. 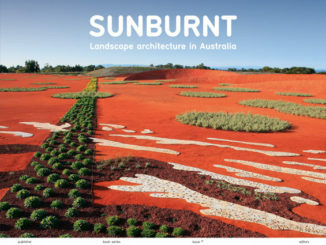 WLA interviewed HASSELL by email about the design and various aspects of the design process. What was the design process for creating The Immersery? 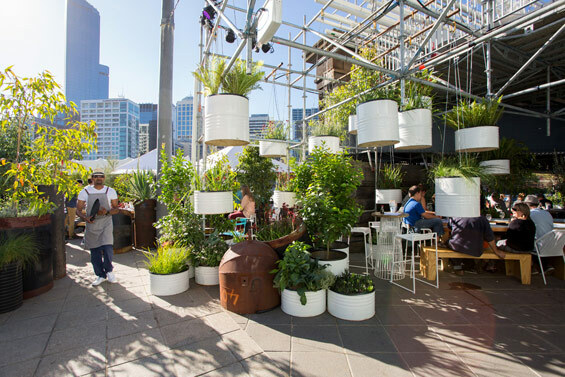 HASSELL was approached by the Melbourne Food and Wine Festival after the success of last year’s Urban Coffee Farm and Brew Bar. The brief for this year’s festival hub was quite open – we were given a preferred site location and asked to design a space that would house their desired programs while exploring the festival-wide theme of water. They are an amazing client and their loose brief gave us incredible creative freedom. Throughout this cyclical journey we identified three key conditions: solid, liquid and vapour. 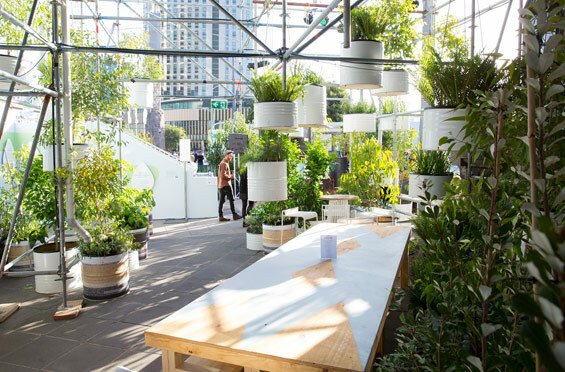 The design challenge really became how to evoke these conditions while housing Melbourne Food and Wine’s programs in a temporary venue that would provide unique and exciting experiences for the visitors. We also had to accommodate opportunities for education about this cycle and our central role within it. How did the The Immersery originate? We sought to represent the identified conditions of water across the three level changes on site: river, square and bridge levels. 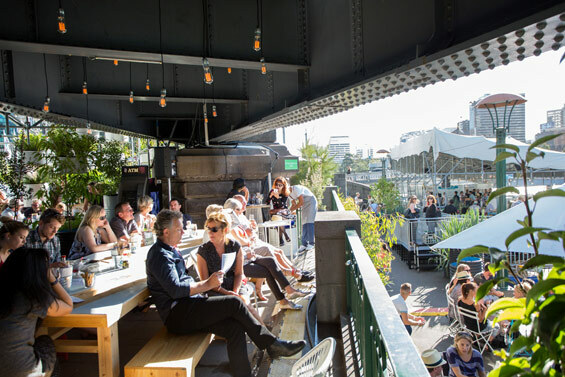 A bar space atop a barge floats on the Yarra River – we imagine this as a solid iceberg-like element tethered to the edge of the site. A canopy of plumbing pipes atop the disused Sandridge Bridge evokes the form of a cloud and its machine-like function. Visitors can climb a stair into the vaporous form where a sound component by Philip Samartzis and a mist installation helps contribute to the experience. Raingardens drip suspended beneath the cloud and bridge above the square to emphasise the liquid state and drought tolerant planting envelopes the diners. Accompanied by a water-inspired menu and cocktail list that explores the three conditions, the spaces immerse the visitor into the many facets of the water cycle, and hence the title of ‘The Immersery’ was born. That said we should make clear that it wasn’t us who came up with the title – it was the brilliant team at Melbourne Food and Wine Festival. Creating an installation like this can be freeing; what was the most fun and liberating aspect of designing The Immersery? One of the great things about working on a project like this, and with a client like MFWF, is that we are given quite a lot of creative control. As we said before, the brief was quite open in the first place, and we were given the opportunity to develop a strong concept that would meet the festival’s requirements through a return brief. One of the other great aspects of being able to work on a temporary project is the time frame. It’s very exciting to see your design take shape so quickly when most of our other projects take years to be realised. This type of project also brings with it a certain design flexibility that other, more rigid work would not allow. We could adapt the scheme to accommodate found materials and the like, for example. With this method of design, a hands-on approach during construction and very close relationship with the builders becomes necessary to allow us the freedom to make decisions during the build, which the team really enjoyed and resulted in a better overall outcome. What were the constraints for the concept? A temporary project such always has its constraints. A tight budget limited the concept to materials that could be found at a relatively low cost, donated, and preferably returned to circulation or recycled after the event. Further to this there were only nine days to build on site so materials need to be readily accessible and easy to work with. We chose to select materials that would reflect the concept and contribute to the project aesthetically. For us, an example of a material that met these criteria was PVC pipe. 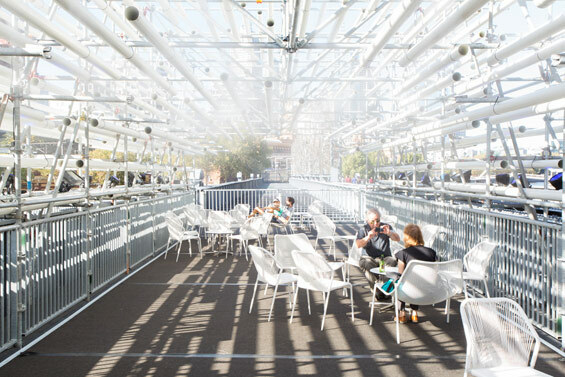 The Schiavello team assembled 1.5km of PVC pipe to create the ‘cloud’ canopy in a few short days. The pipe was kept in six and three metre lengths so that it could be reused in other construction projects following the festival. Another constraint was the site itself where level changes and the proposed occupation of construction grade barge and de-commissioned bridge and posed a number of problems in regard to OH&S and public safety. We worked closely with an access consultant and the scaffolding contractor to achieve spaces which could be used by all members of the community. A new gang plank and custom balustrading was constructed for the barge and bridge spaces – and we had tonnes of conversations and schemes about how best to ramp up to the new bridge platform. 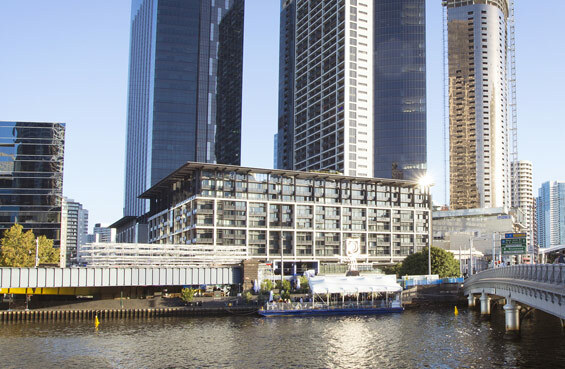 Just accessing the site safely became a large preoccupation, we weren’t sure if the barge would even fit under the multiple bridges across the Yarra River to reach the site. Twenty-three industrial pipes up to two metres in diameter had to be craned on to the square and river front, and the scaffolder had to find a safe and fast way to deck the dis-used bridge structure so that the rest of construction could begin. All this occurred in the middle of Southbank in a public space that thousands of people pass through every day. Who was involved in the realisation of the design? The design was very much a joint effort between a number of collaborators. 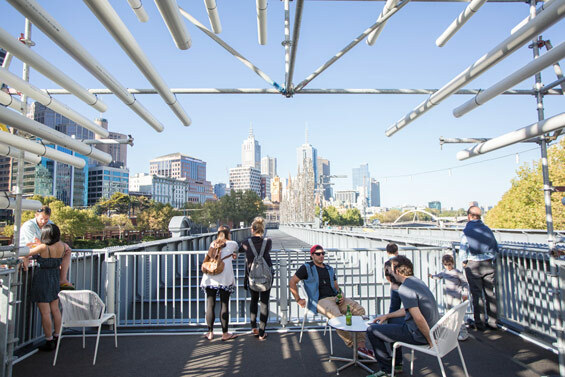 Within HASSELL, the design was conceived and executed by the Young Designers Group, a collective at the early stages of their careers, from various disciplines – Landscape Architecture, Architecture and Interior Design. The engineers at Aurecon helped us ensure the cloud would stand up and people could inhabit the bridge and barge safely (and that the cloud wouldn’t become a giant pipe organ during windy weather!). 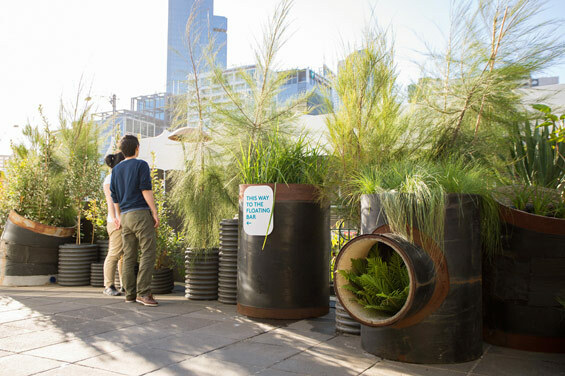 We worked closely with Melbourne Water to develop engaging raingardens that visitors would be encouraged to learn something from. Warner’s and Tall Tree’s nurseries advised on and provided vegetation to realise the water-wise landscape that bleeds across the entire installation. The project managers at Montlaur ensured the design development and construction process rolled out smoothly and all the while the team at Melbourne Food and Wine Festival ensured the design team was supported so that the project could be realised. Those mentioned are only a handful of the stakeholders, partners, and consultants involved, who have given time, labour and/or goods, to see the vision take shape. What will happen to The Immersery once the festival is over? Once the festival is over, The Immersery will be dismantled and the site will return to its original state. Almost all materials used to build The Immersery will go on to be reused, recycle or reappropriated. We have been careful to pick materials which not only artistically represent the city’s water infrastructure story, but are also on their way to be recycled, are borrowed, or can go on to be used in future water infrastructure of the city. All plants will be returned to their respective nurseries and rehabilitated so they can lead long, happy lives. 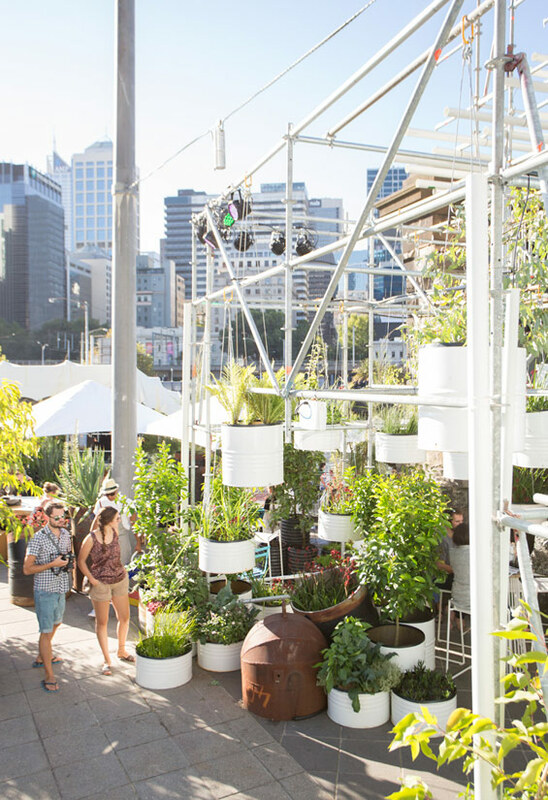 The containers that house the festival kitchen and amenities will go onto be used in other festivals and events, the barge will go back to the Port of Melbourne where it will take up its traditional construction duties. 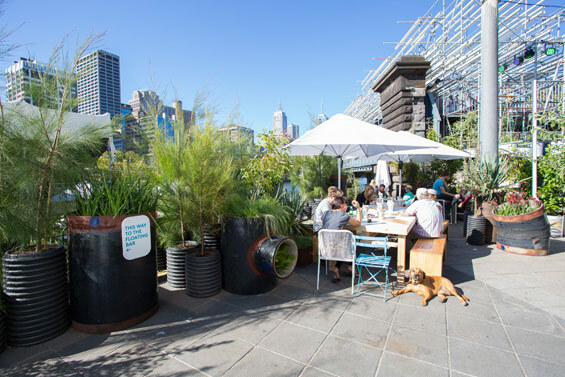 The Immersery is a fantastic opportunity to provide the people of Melbourne and its visitors with not just a unique dining and bar experience, but a chance to demonstrate the potential of remnant and disused spaces in our public domain and their inherent value.